I recently met a very nice lady by the name of Dana. Her energy about beading is infects and I simply had to share her work with you. My name is Dana Powers I am married and have 2 grown children and 5 awesome grandchildren. 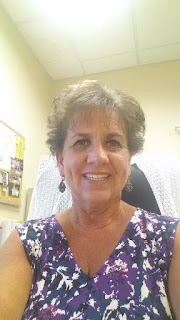 I work full time for a Domestic Violence Shelter. I have been beading for over 10 years. 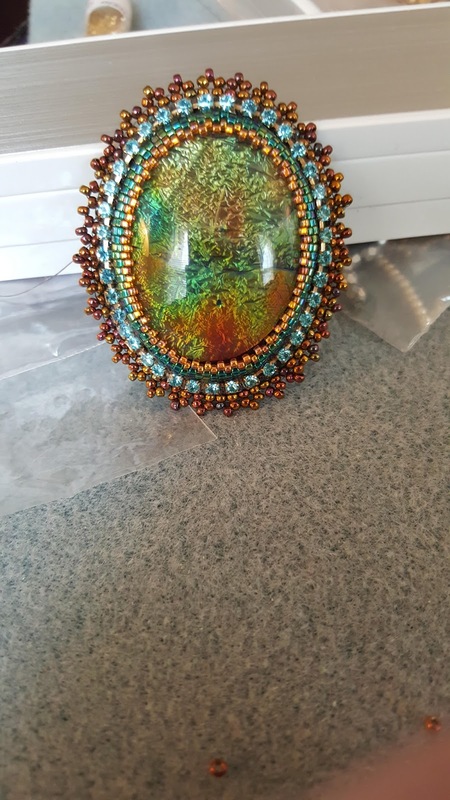 Beading is a form of relaxation for me. Bead embroidering is my favorite form of stitching. I feel as though I am painting with beads. 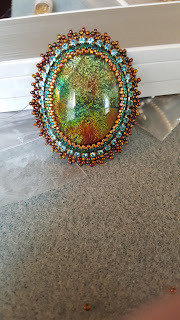 I don't have a pattern and I create as I bead. I may see a color combination or an item that I want to incorporate into my beadwork. I am so fortunate to have beadwork in my life. I like using Nicole's BeadBacking foundation to bead on, because it is already colored. I used to dye my own material and it is time consuming and messy. If you are close to these shops check out Dana's art. She is one of the few who has a job where being at work can deplete your energy. I am so happy for her to have found an outlet that helps her find relaxation and renewal. She creates beautiful beading pieces. Hi Carol, was it my shelter? Women Strength? Bless your heart, Dana! It is a pleasure to meet you! Gorgeous creation!!! What lovely bead art! It is so very pretty.